Tripods are used for both still and motion photography to prevent camera movement. They are necessary when slow-speed exposures are being made, or when lenses of extreme focal length are used, as any camera movement while the shutter is open will produce a blurred image. In the same vein, they reduce camera shake, and thus are instrumental in achieving maximum sharpness. A tripod is also helpful in achieving precise framing of the image, or when more than one image is being made of the same scene, for example when bracketing the exposure. Use of a tripod may also allow for a more thoughtful approach to photography. For all of these reasons, a tripod of some sort is often necessary for professional photography as well as certain video uses. Tripods are also used as an alternative to C-Stands to photographic accessories. For maximum strength and stability, most photographic tripods are braced around a center post, with collapsible telescoping legs and a telescoping section at the top that can be raised or lowered. At the top of the tripod is the head, which includes the camera mount (usually a detachable plate with a thumbscrew to hold on to the camera), several joints to allow the camera to pan, rotate and tilt, and usually a handle to allow the operator to do so without jostling the camera. Some tripods also feature integrated remote controls to control a camcorder or camera, though these are usually proprietary to the company that built the camera. Materials used in the construction of tripod or monopod legs include metal (typically bare or painted aluminum), wood and carbon fiber-reinforced plastics, among others. Per ISO 1222:2010, the current tripod screw thread standard for attaching the camera calls for a 1/4-20 UNC or 3/8-16 UNC thread. Most consumer cameras are fitted with 1/4-20 UNC threads. Larger, professional cameras and lenses may be fitted with 3/8-16 UNC threads, plus a removable 1/4-20 UNC adapter, allowing them to be mounted on a tripod using either standard. Historically, The Royal Photographic Society recommended the thread standard for attaching older cameras to tripods was 3/16-24 BSW (3/16 inch nominal diameter, 24 threads per inch), or 1/4-20 BSW for smaller cameras and 3/8-16 BSW for larger cameras and pan/tilt heads. In this application, the BSW and UNC thread profiles are similar enough that one can mount a modern camera on a legacy tripod and vice versa. The UNC threads are a 60-degree angle and flattened, whereas the BSW are a 55-degree angle and rounded crest. However, at least one English manufacturer uses No.1 B.A. (British Association) for its tripod mount thread. A tabletop tripod with a ball head. There are several types of tripods. The least expensive, generally made of aluminum tubing and costing less than US$50, is used primarily for consumer still and video cameras; these generally come with an attached head and rubber feet. The head is very basic, and often not entirely suitable for smooth panning of a camcorder. A common feature, mostly designed for still cameras, allows the head to flip sideways 90 degrees to allow the camera to take pictures in portrait format rather than landscape. Often included is a small pin on the front of the mounting screw that is used to stabilize camcorders. This is not found on the more expensive photographic tripods. More expensive professional tripods are sturdier, stronger, and usually come with no integrated head. The separate heads allow a tripod-head combination to be customized to the photographer's needs. There are expensive carbon fiber tripods, used for applications where the tripod needs to be lightweight. Many tripods, even some relatively inexpensive ones, also include leveling indicators for the legs of the tripod and the head. Many of the more expensive tripods have additional features, such as a reversible center post so that the camera may be mounted between the legs, allowing for shots from low positions, and legs that can open to several different angles. A tripod with flexible legs permitting it to grip to some objects. Small tabletop tripods (sometimes called tablepods) are also available, ranging from relatively flimsy models costing less than US$20, to professional models that can cost up to US$800 and can support up to 68 kg (150 lb). They are used in situations where a full sized tripod would be too bulky to carry. An alternative is a clamp-pod, which is a ball head attached to a C-clamp. Another technique involves forming a string triangle held taut around the two feet of the photographer and linked to the camera. This negative string "tripod" can stabilize the camera sufficiently to use a shutter speed three stops slower. The head is the part of the tripod that attaches to the camera and allows it to be aimed. It may be integrated into the tripod, or a separate part. There are generally two different types of heads available. A ball head, showing panoramic rotation lock lever, and ball lock knob. A ball head utilizes a ball joint to allow movement of all axes of rotation from a single point. Some ball heads also have a separate panoramic rotation axis on the base of the head. The head has two main parts, the ball, which attaches to the camera and the socket, which attaches to the tripod. The camera is attached to the ball via quick release plate, or a simple UNC 1/4"-20  screw. The socket is where the ball rotates in, and also contains the controls for locking the ball. The socket has a slot on the side, to allow the camera to be rotated to the portrait orientation. Ball heads come in varying styles of complexity. Some have only one control for both ball and pan lock. While others have individual controls for the ball, pan, and also ball friction. Ball heads are used when a free-flow movement of the camera is needed. They are also more stable and can hold heavier loads, than pan-tilt heads. However, ball heads have the disadvantage that only one control is available to allow or prevent movement of all axes of rotation, so if the camera is tilted on one axis, there may be a risk of tilting on the other axes as well. When a movement of one, or two axes or rotation is needed, a pan-tilt head is used. The pan-tilt head has separate axes and controls for tilting and panning, so that a certain axis can be controlled without risk of affecting the other axes. These heads come in two types, 2-way and 3-way. 2-way heads have 2 axes and controls, one for panoramic rotation, and one for front tilt. 3-way heads have 3 axes and controls, one for panoramic rotation, front tilt, and lateral tilt. The controls on these heads are usually handles that can be turned, to loosen or tighten the certain axis. This allows movement in one, a few, or none of the axes. When the movement of all axes of rotation is needed, a ball head is used. There are some pan-tilt heads that use gears, for precision control of each axis. This is helpful for some types of photography, such as macro photography. Other head types include the gimbal head, fluid head, gear head, alt-azimuth, and equatorial heads. Fluid heads and gear heads move very smoothly, avoiding the jerkiness caused by the stick-slip effect found in other types of tripod heads. 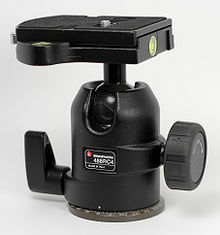 Gimbal heads are single-axis heads used in order to allow a balanced movement for camera and lenses. This proves useful in wildlife photography as well as in any other case where very long and heavy telephoto lenses are adopted: a gimbal head rotates a lens around its center of gravity, thus allowing for easy and smooth manipulation while tracking moving subjects. In place of or to supplement a tripod, some photographers use a one-legged telescoping stand called a monopod for convenience in setup and breakdown. A monopod requires the photographer to hold the camera in place, but because the monopod reduces the number of degrees of freedom of the camera, and also because the photographer no longer has to support the full weight of the camera, it can provide some of the same stabilization advantages as a tripod. For low-angle shots particularly in cinematography, short tripods with fixed length legs and no center column may be used. The lowest of these is called a low hat, with a slightly higher version referred to as a hi hat. A travel tripod is one that has been designed to fit certain criteria including lightness and rigidity to give the photographer the freedom to travel and carry his/her tripod for extended periods. It must be small and light enough to be carried as hand baggage yet has enough strength to support a professional DSLR and fast telephoto lens. Typical specifications for a travel tripod legs would be: Weight (without head): 2 to 4 lbs (0.9 to 1.8 kg), Height (contracted): 12 to 20 inches (30 to 50cm), Height (extended): - 60 to 70 inches (152 to 178cm) and Max Load: 5 to 10 lbs (2.3 to 4.6 kg). ^ www.mipraso.de, Michael Prandl,. "Camera mount Threads". www.gewinde-normen.de. ^ Wanderlust, Always. "Travel Tripods". Always Wanderlust. Always Wanderlust. Retrieved 22 December 2018. Wikimedia Commons has media related to Tripods (photography).